…a stirring blend of biography, Americana, and history restoring in complete, human, authentic detail one of the most thrilling stories in our American past. 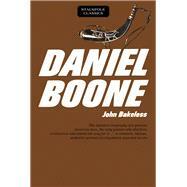 In pages as exciting as an old dime novel, John Bakeless introduces to us all Daniel Boone—trapper, Indian fighter, contact to the forest people, surveyor of the Dark and Bloody Ground, law-giver to unruly frontier settlers, pathfinder, hunter… a figure already half-legendary in his own time. To explore the legend and recreate reality is John Bakeless’s achievement in this unmatched adult biography of a man and an era. Drawing upon much hitherto unpublished material, he sorts fact and fancy to provide this documented portrait…and at the same time, a stirring chronicle that captures the spirit of these uniquely America, heroic decades. John Edwin Bakeless was born in Carlisle, Pennsylvania on December 30th, 1894. He wrote several biographies of America’s early explorers. Among his most well-known works are Lewis and Clark, Partners in Discovery, and Daniel Boone, Master of the Wilderness.